Well, I think this coffee has done away with my caffeine habit. I’m down to a half cup diluted with water and that is only because I needed to wake up. I’ve noticed that most of the people on this ship are tea drinkers. Now, I know why. Our watch began with sailing to the next plankton station. A squall began, so it was time to get my raingear on. During the squall birds seemed to be attracted to the ship. Toward the end of the storm a little warbler landed on deck. He kept trying to find a place to land away from people. Finally, he was so tired, he landed at my feet. After a few seconds he flew to the edge of the stern. He contently waited out the storm there. I asked Laurie, one of the marine biologists if she had any ideas on why the birds were following us. Apparently, there was a birder on the last trip that explained because we are close to shore (one of my favorite spots, Corpus Christi) the insect were attracted to our lights and the birds are attracted to the insects. Again we had problems with the plankton tow. After they got the equipment fixed another squall started and the deployment of the equipment was delayed, once again, until the end of the storm. We finally got to the Shark Station. Not too exciting tonight. We only caught two dogfish sharks. I didn’t even take pictures because it paled to what we have all ready done. We are at the last Shark Station for our watch. I guess we saved the best for last. 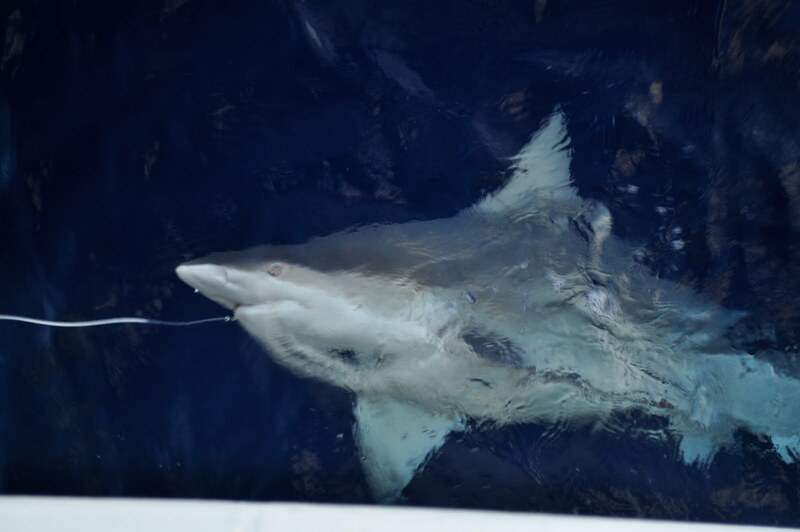 Hook number 82 gave an 16 foot Sand Shark,. 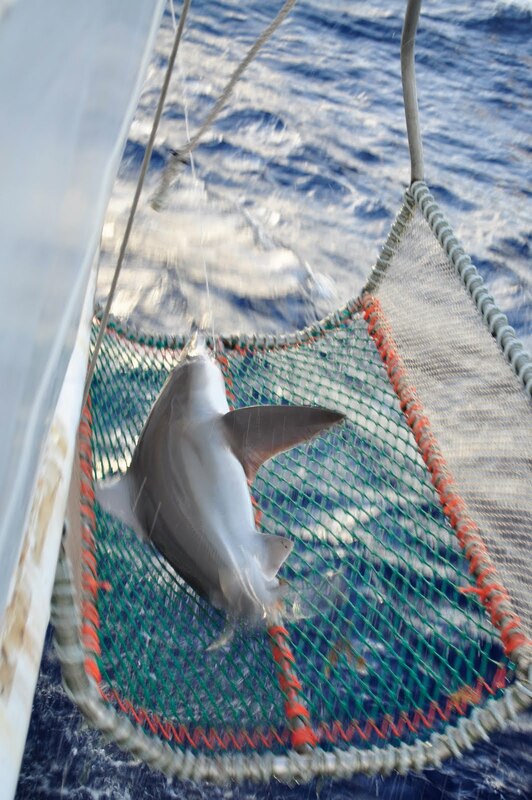 Too big to be brought on deck, she was measured and weighed in her basket. 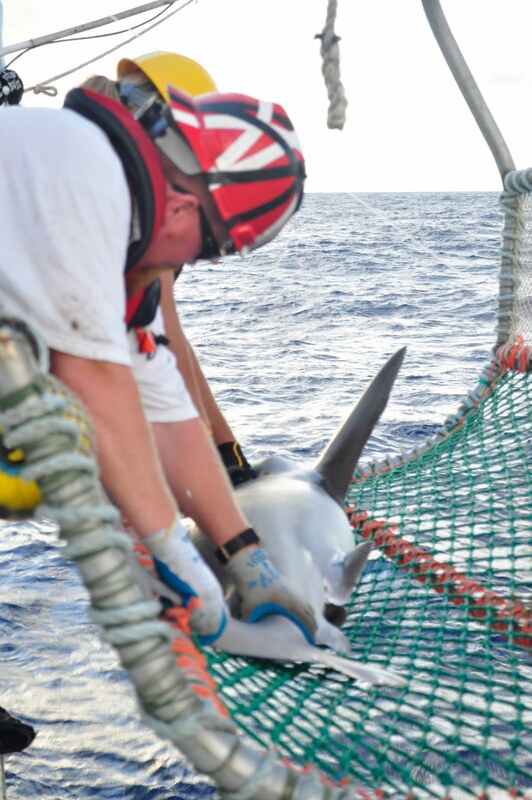 Tissue samples were taken and she was tagged before we let her go. Exciting!!! !